"Chia seeds make great desserts and are high in omega-3s. This recipe is a healthy alternative to processed desserts. It uses agave (or stevia if you prefer) as a sweetener instead of sugar. Stir again before serving and top with fresh fruit and another dash of cinnamon or spices." Whisk coconut milk, unsweetened coconut milk, agave nectar, vanilla extract, cinnamon, and salt together in a bowl; pour over chia seeds and stir well. 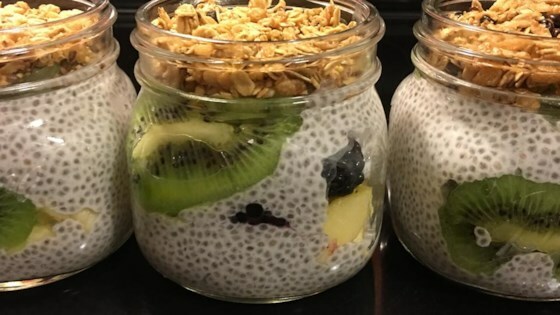 Allow coconut milk-chia seed mixture to soak until thickened, at least 20 minutes, or cover bowl with plastic wrap and refrigerate overnight. Stir pudding and top with strawberries. You can substitute stevia or sugar for the agave. You can also substitute milk, soy milk, or almond milk for the coconut milk. However, this will change the flavor. This recipe turned out great! My kids enjoyed this and kept eating more! I added fruits like fresh pineapple, kiwi, pears and granola since I didn't have strawberries. It's a keeper!